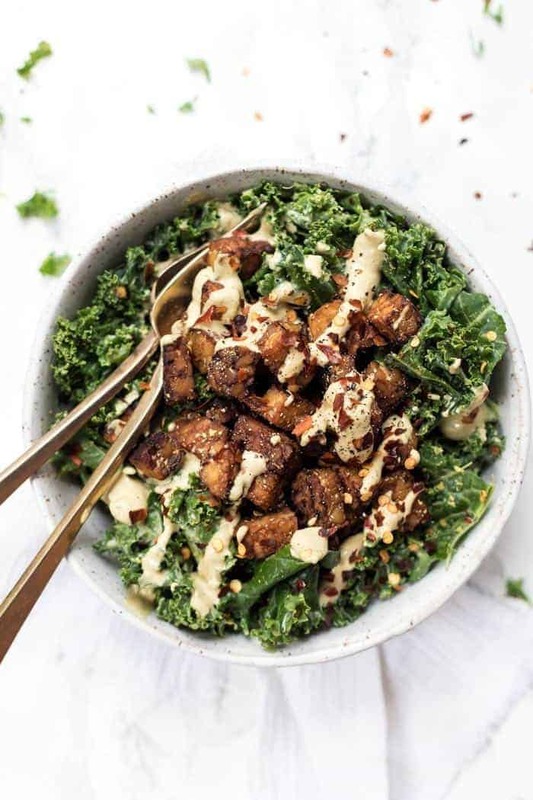 This creamy kale salad is tossed in a spicy vegan dressing and topped with smokey tempeh croutons. It's light, healthy and super simple to make! The other week I went to lunch with my friend Ali (you might know her as @inspiralized on Instagram). It had been forever since we'd seen each other and we were in much need of a good catch up and some girl time. We went to one of our favorite restaurants in the city: The Butcher's Daughter. It's a vegetarian gem with a few locations in NYC and LA, and while not always incredible, it's always really good. Like one of those places that you know you can count on for a tasty and healthy meal. And the setting is super cute too! Anyway, I ordered a spicy kale salad with tempeh bacon and oh my gosh it was SO good. One of the best meals I'd had there in ages and I knew I wanted to somehow recreate it at home so I could have it for lunch like all the time. So yep, that's what we've got today. My version of that delicious salad, that we can now all enjoy from the comfort of our own couches/dinner tables! 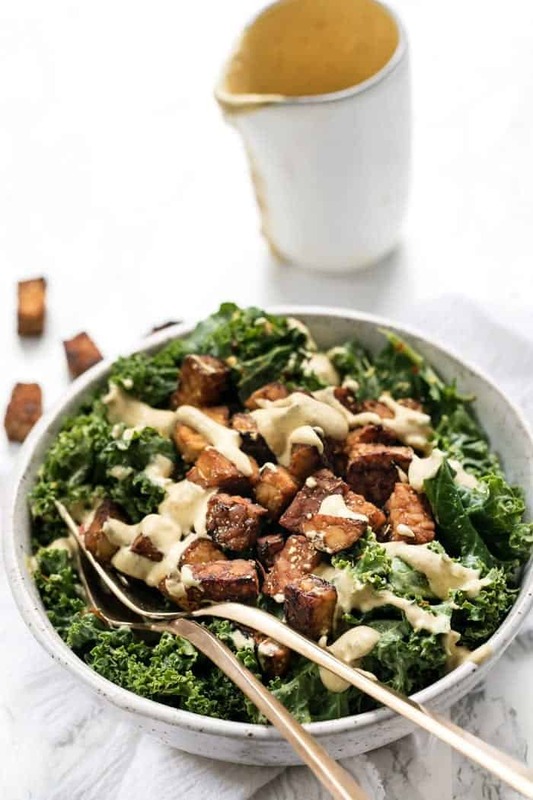 A creamy kale salad, tossed with a cheesy dressing and topped with smoky tempeh croutons! I won't say it's exactly like the one I had at the restaurant, but it's pretty dang close. And I'd like to think that my version is probably a little bit healthier and more allergy-friendly – less sodium, nothing fried and a nut-free vegan dressing. Let's first talk tempeh. 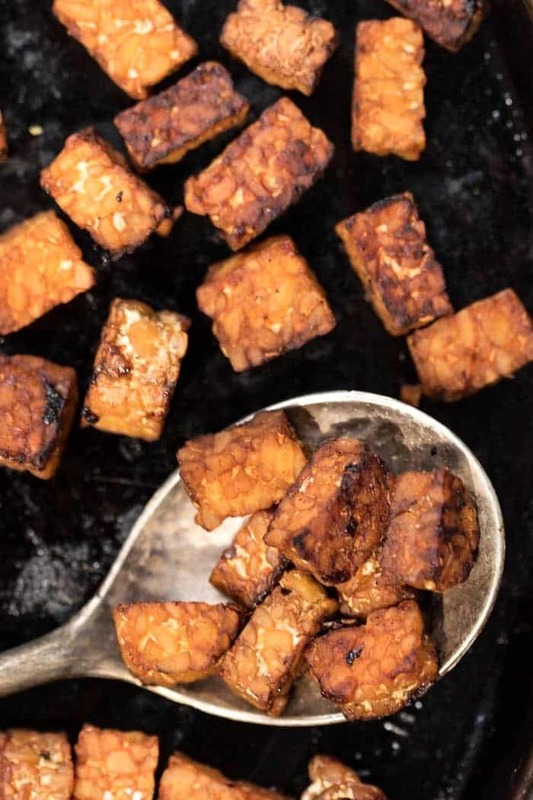 If you aren't familiar with what tempeh is, it's made fermented soybeans and acts as an alternative to tofu. Since the beans are fermented first, a lot of times, people who struggle with gut issues find that tempeh is easier on their system than tofu. 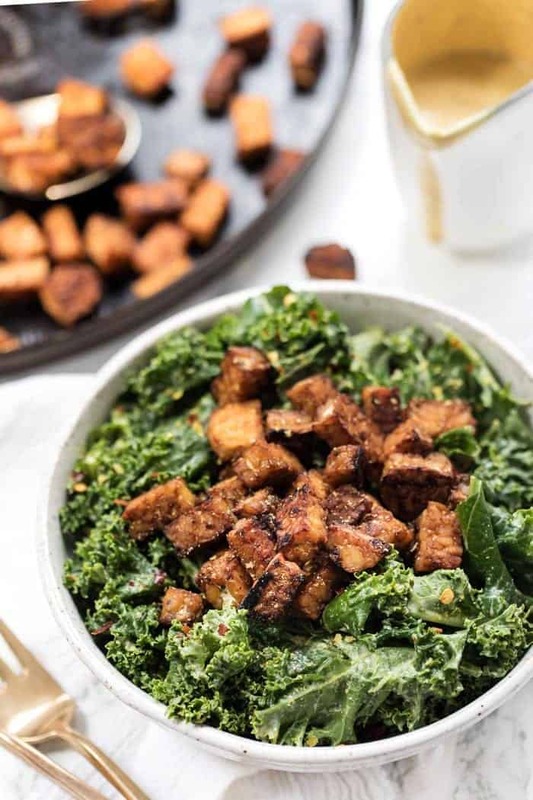 For our smoky tempeh croutons, we're going to simply toss them with a quick “glaze” bake them up until they're nice and crispy and then use them as a crouton/bacon-esque bite. The secret for getting that deep smoky flavor? Liquid smoke. Liquid smoke essentially is concentrated wood smoke, that's put into a liquid and used to get that flavor that you associate with smoked things (bbq, bacon, ribs, etc.). It's almost always plant-based which is great, so we can turn any number of ingredients into a meat alternative. And today we're doing that with tempeh! 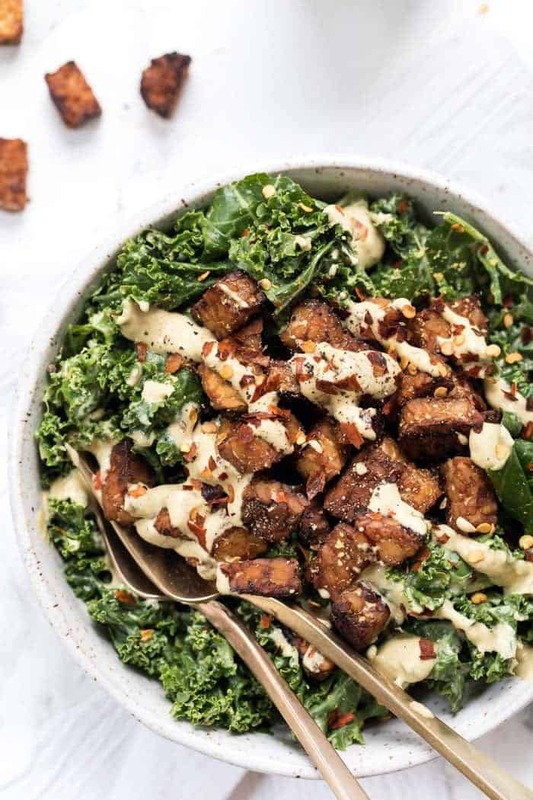 The dressing for our creamy kale salad is similar to my vegan caesar dressing, but I added more red pepper flakes to make it a little spicy. Unlike a lot of vegan caesar dressings, my version is tahini-based which means it's nut-free and we don't have to worry about soaking cashews for hours on end. We can just simply blending everything up in a few seconds and we've got the most luxurious dressing. And yes, curly kale is the perfect vessel! I love how the dressing gets trapped in the little folds of the kale, so each bite is bursting with tangy flavor. Topped with that smoky tempeh and it's the ultimate combo: slightly sweet, perfectly tangy, crunchy, creamy, and chewy all at the same time! 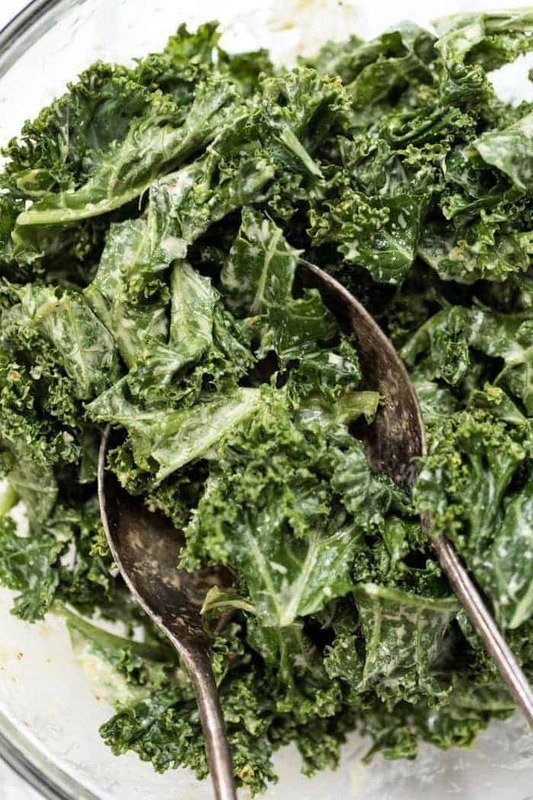 Kale salads aren't typically the most exciting thing around, but I gotta tell you, we are obsessed with this recipe! It's a go-to for busy weeknights and I actually also like to keep the tempeh on hand for other things like wraps and pasta salads. This salad will keep in the fridge for a few days (just store the tempeh separately), so it's also great for meal prep. And finally, I'd also recommend making a double batch of that dressing… you'll want to put it on everything! I drizzle it on my wraps and sandwiches, I use it as a dip for sweet potato fries and sometimes I even use a little with my pesto pasta. It's SO good! 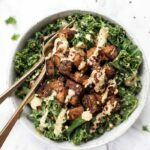 This creamy kale salad is tossed in a creamy vegan dressing and topped with smokey tempeh croutons. It's light, healthy and super simple to make! Preheat the oven to 375ºF. Grease a baking sheet with cooking spray and set aside. 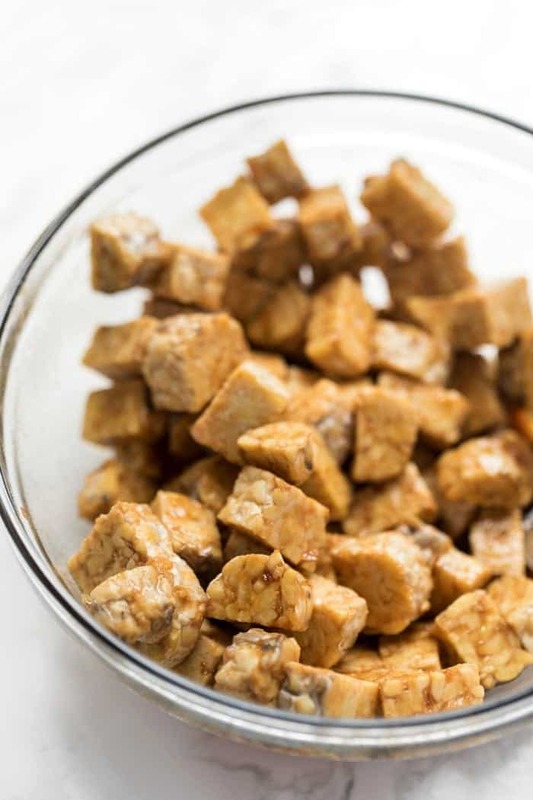 Chop the tempeh into crouton-sized chunks (about 1/2") and add them to a bowl. To the bowl add the tamari, liquid smoke, oil, syrup and hot sauce and toss to combine. Transfer the tempeh to the baking sheet and bake for 30 minutes, flipping halfway through. While the tempeh is cooking, add the tahini, lemon, vinegar, nutritional yeast, mustard, capers, garlic powder, chili flakes, salt, pepper and 1/4 cup of water to a blender. Blend on high until smooth, adding more water as needed. To assemble the salad, add the kale to a large bowl. Pour dressing over the greens and mix with your hands to thoroughly combine. Transfer to bowls and top with croutons. Garnish with additional chili flakes, nutritional yeast and pepper if desired!